Tyler Perry's Good Deeds may be the first white people problems movie ever made by a black filmmaker. In it, a software company CEO (Perry) reconsiders his life choices after helping a cleaning lady (Thandie Newton) makes him realize that his successful business, gorgeous fiancée and rich family life leave him unsatisfied. Given the current economic climate, it'll be interesting to see if fans find this this opulent wish-fulfillment story to be ill-timed, but Perry's core audience needs its own Eat Pray Love as badly as do the entitled, delusional women who clicked with Elizabeth Gilbert's jet-setting best-seller. As with its predecessors, Tyler Perry's Good Deeds is poised to reap strong rewards at the box office before enjoying a healthy life on VOD and home video. Previously, Perry's only starred in his films as his cartoonish alter ego Madea. But here he mixes up tradition to play Wesley Deeds, a "fifth-generation Ivy League graduate" who has quietly and successfully settled into a life of complacency. Wesley's domineering mother Wilimena (Phylicia Rashad) controls him, his resentful brother Walter (Brian J. White) undermines him, and his independent fiancée Natalie (Gabrielle Union) quietly amuses herself predicting his daily routine down to his choice of tie and oatmeal. However, after running afoul of a troubled custodian named Lindsay (Newton) and her precocious daughter Ariel (Jordenn Thompson), Wesley begins to realize how out of touch he is with the world beneath his penthouse apartment-and how disconnected he is from himself. Trying to help Lindsay get back on her feet as she struggles to evade homelessness (that is, when she's not biting his head off for his unsolicited parenting advice and ignorance of the cost of a gallon of milk), Wesley begins to reconnect with his own passions. But after Wesley's family and his fiancée start to question his and Lindsay's blossoming friendship, he is forced to decide if there's a difference between a life of success and affluence, and substance and happiness—and if there is, which one does he truly want? It's indisputable that Perry has improved as a filmmaker throughout his meteoric rise to success, but that growth only brings into clearer focus the deficiencies he has yet to outgrow. As a director, he is tenuously proficient. As an actor, he's awkward and undeservedly self-satisfied. But as a writer, he's at best a purveyor of melodrama, crafting numbing dialogue, stilted exchanges and just plain unconvincing sequences that 11 films into his career should be more sophisticated, or at least more refined. What he has isn't style—it's a market share, and he dominates it because there's virtually no competition. Which means his ongoing (and expanding) success only validates his work rather than shaping it into something bigger, better and more impactful. There's something genuinely incredulous about a filmmaker incapable even of using clichés correctly, like when Wesley says to a coworker, "There's something I want to burn the midnight oil on." As per usual, however, Perry assembles a top-notch ensemble of talented African-American actors, and the shallowness of what they have to do in his film only highlights how poorly their offers must be elsewhere in the industry. Newton is the film's undisputed MVP, handling Lindsay's bull-headed pride with a soulful delicacy and finding the right amounts of strength in even her most vulnerable moments. Union conveys palpable intelligence and sophistication, but the particle-board flimsiness of her character's evolution never fully utilizes those qualities. And the sleek, polished and powerful White mostly rescues his angry brother from being an "angry black male" cliché, if only because he's a different kind of angry than usual. But all of these actors deserve better material than this script—and especially deserve better leading men to spar with than Perry, who is as uncertain an actor as he is a clumsy storyteller and filmmaker. That said, it's essential for Perry to add these films to the current cinematic landscape, because what moviegoers need right now are normalized portraits of black life—ones that acknowledge race but are not "about" it. The disappointment is that these films reflect a cartoonish notion of that normalcy, at best. But Good Deeds puts Perry on the same playing field as folks like Ryan Murphy, who adapted and directed Eat Pray Love, and any of the dozens of inch-deep screenwriters and directors who coddle audiences into thinking their dreams are attainable without effort or change. It's lunk-headed gratification bolstered by great performances, and Perry's most mainstream-accessible effort to date. 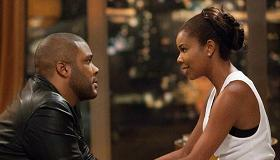 Now, his fans and critics must decide whether that means a marked improvement or lateral move from his previous work, but with Good Deeds, Tyler Perry has finally achieved an odd kind of equality that heretofore eluded him: he's now just as mediocre and middle of the road as any other reliable hitmaker in Hollywood.